Celebrate Father’s Day with South America’s fluffy, hard-working super dad! It looks as if the cotton-top tamarin twins in the photo above are pretty attached to Dad! Their tiny fingers and toes grip his fur tightly, keeping the babies secure as he perches on a branch high above the ground. When they were born, each helpless baby weighed only a little more than a slice of bread. At first, their mom and dad stuck close together. Mom nursed the tiny babies but would turn them over to Dad whenever she needed a quick food break. But soon, Mom started spending much of her day looking for food so her body could make enough milk for the growing twins. That left Dad in charge—with two little monkeys on his back! The cotton-top tamarin is one of the smallest monkeys in the world—about the size of a squirrel. And it lives a squirrelly lifestyle, too, using its sharp, claw-like nails to scurry around in the trees of northwest Colombia’s tropical forests. The miniature monkeys live in small, tight-knit groups. In each group, only one female and one male get to mate and have babies. The rest of the group pitches in to feed, groom, and carry the babies. And who does a lot of the toting around? You guessed it: dear old Dad. Cotton-top tamarins spend nearly all their lives in trees. Up there, they find a forest feast. Topping the menu is fruit, which makes up nearly half of what they eat. The rest of their diet may not sound so scrumptious to you: insects, spiders, sap, and the occasional lizard. At first, the baby tamarins just drink Mom’s milk. But once they are ready to try solid food, Dad and the other members of the group bring bits of their own meals for the twins to try. In the dense forest where they live, cotton-top tamarins are tough to spot. But they are experts at making themselves heard! Scientists have identified 38 different sounds that the monkeys use to communicate. 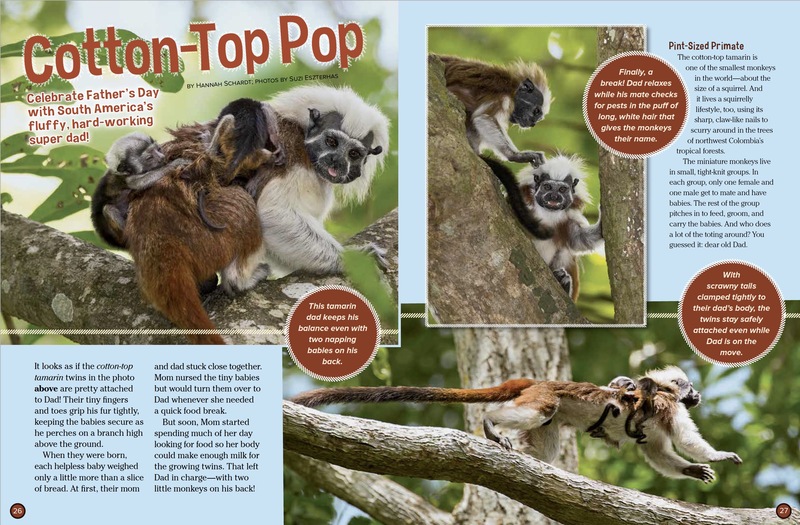 In “tamarin talk,” chirps, squeals, screams, and chatter say everything from Help me! to Come quick—I found something delicious! For now, these babies make only a few sounds—just enough to get the food and care they need. But they listen and learn. And by the time they’re all grown up, they’ve got plenty to say—and plenty of ways to say it! Cotton-top tamarins are among the most endangered primates in the world. They’re found only in one small part of Colombia, and people are cutting down much of their forest home there to build roads, houses, and farms. Also, people sometimes trap the adorable monkeys to sell them as pets. But a group in Colombia called Proyecto Tití (proh-YEK-toh tee-TEE) is working hard to save the tamarins by preserving the forests where they live. (Tití is the local word for a tamarin.) Members of the group also visit local schools to teach kids that cottontop tamarins are special and should be protected. 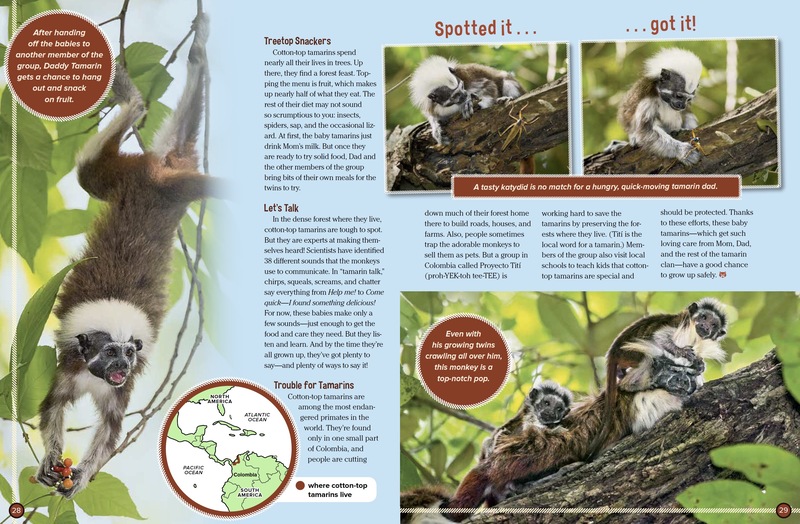 Thanks to these efforts, these baby tamarins—which get such loving care from Mom, Dad, and the rest of the tamarin clan—have a good chance to grow up safely. “Cotton-Top Pop” originally appeared in the June/July 2017 issue of Ranger Rick magazine.